Yes, the Secretary of State Fist-Bumped Snoop Dog. Just Watch. On November 14, President Obama vigorously defended U.N. ambassador Susan Rice during a press conference in the White House's Rose Garden, perhaps signaling that he was unworried by the possibility of a drawn-out battle with Republicans looking to block Rice's possible nomination as secretary of state. 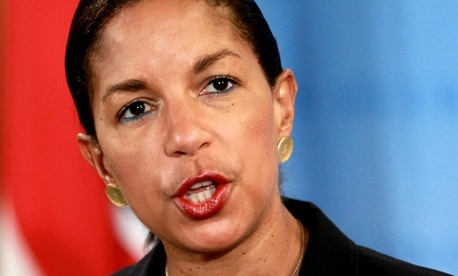 Rice, who has been criticized for her promoting a now-disproven explanation for the deadly attack on an American diplomatic facility in Benghazi, Libya, apparently has the full support of the president that could nominate her for the highest diplomatic position in the land. Things are not quite as amicable at U.N. headquarters. As the conflict in the Eastern DRC escalated, and as two U.N. reports provided extensive evidence of official Rwandan and Ugandan support for the M23 rebel group, Rice's delegation blocked any mention of the conflict's most important state actors in a Security Council statement. And in June, the U.S. attempted to delay the release of a UN Group of Experts report alleging ties between Rwanda and M23. Peter Rosenblum, a respected human rights lawyer and professor at Columbia Law School, says that the U.S.'s reticence in singling out state actors is significant, especially at the U.N. "It shows [Rice] is willing to expend political capital to cast something of a shield over Rwanda and Uganda," he says. "These are the things that in diplomatic settings, they are remarked upon. People see that the U.S. is still there defending the leaders of these countries at a time when many of their other closest allies have just grown sort of increasingly weary and dismayed." Sarah Margon of Human Rights Watch agrees that the U.S. should be more active in naming potential obstacles in resolving the eastern DRC conflict. "It's unacceptable for Rwanda to be violating UN Security Council resolutions and meddling in international peace and security," she says. "I think the U.S. government has a very powerful voice and they need to use it."